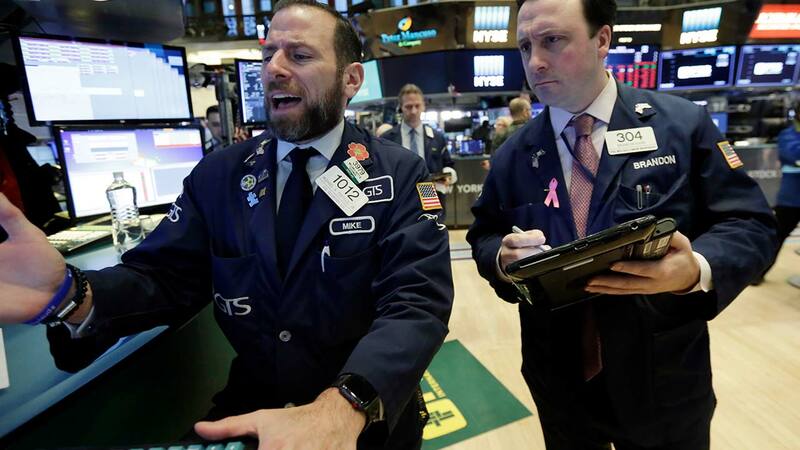 NEW YORK -- The Dow Jones industrial average plunged more than 1,100 points Monday as stocks took their worst loss in six and a half years. Two days of steep losses have erased the market's gains from the start of this year and ended a period of record-setting calm for stocks. The Standard & Poor's 500 index, the benchmark most professional investors and many index funds use, skidded 113.19 points, or 4.1 percent, to 2,648.94. That was its biggest loss since August 2011, when investors were fearful about European government debt and the U.S. came close to breaching its debt ceiling. Wells Fargo sank $5.91, or 9.2 percent, to $58.16. Late Friday the Fed said it will freeze Wells Fargo's assets at the level where they stood at the end of last year until it can demonstrate improved internal controls. The San Francisco bank also agreed to remove four directors from its board. Bond prices tumbled after moving sharply higher on Friday. The yield on the 10-year Treasury slipped to 2.73 percent from 2.84 percent. That hurt banks by sending interest rates lower, which means banks can't charge as much money for mortgages and other types of loans.